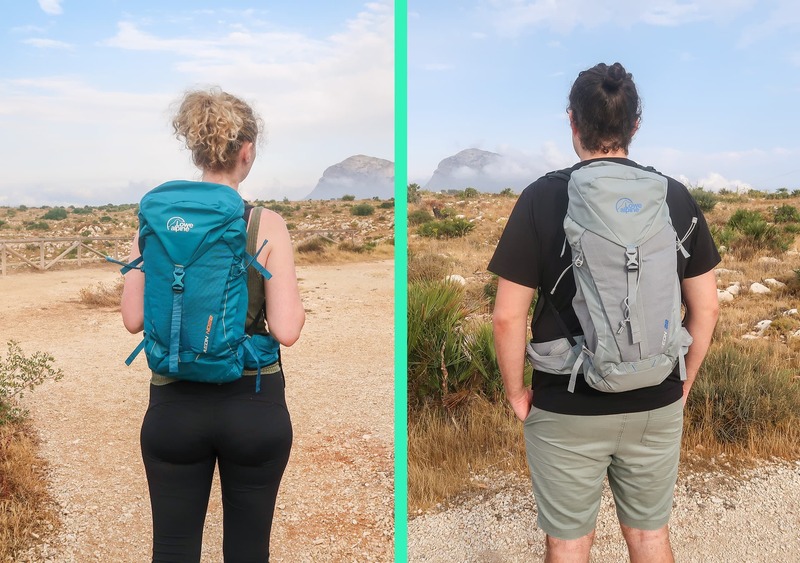 In this review, we’re taking a look at Lowe Alpine’s lightweight and versatile Aeon 22 & ND20 daypacks. 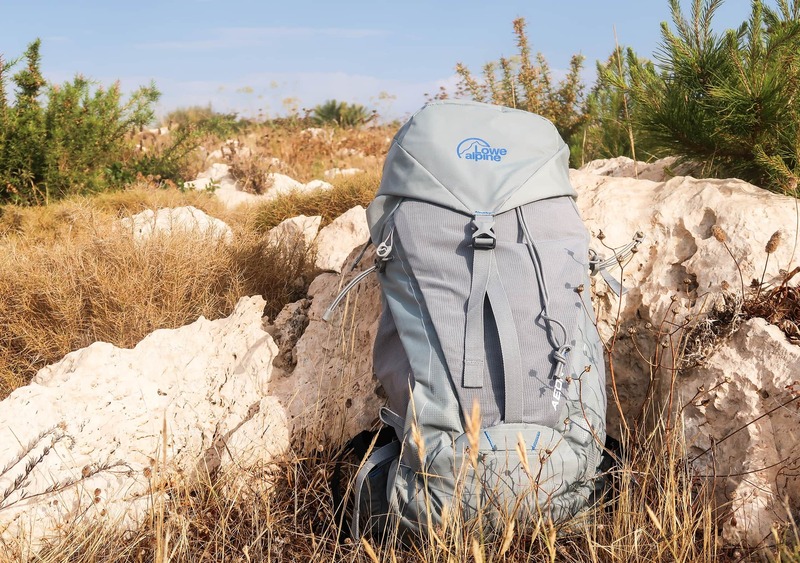 Lowe Alpine is one of the most reputable and well-regarded names in the backpack world, and back in 2017 they celebrated their 50th anniversary—so they’re definitely doing something right. Although their background is primarily in mountaineering bags, they’ve been venturing into the travel world in recent years… and they’ve brought their expertise with them. In their own words, the Lowe Alpine Aeon is for the “multi-activity outdoor enthusiast. 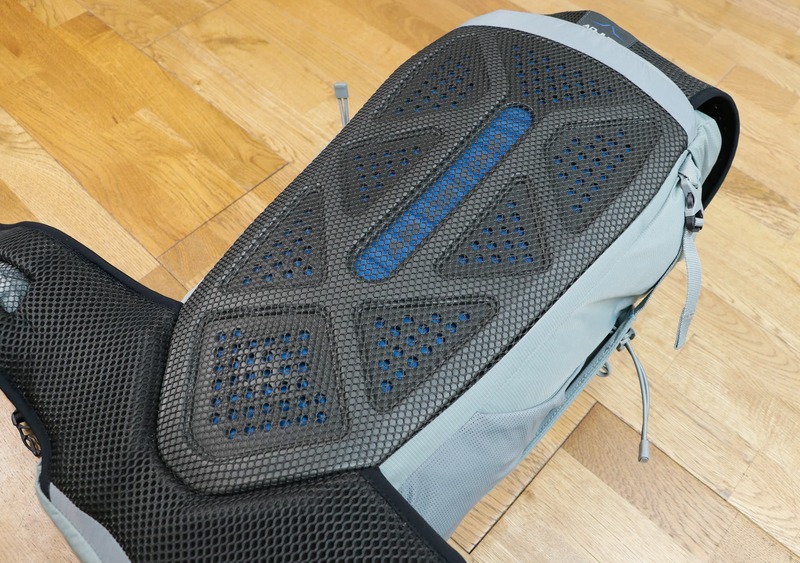 Perfect for long day hikes, quick hits at the local crag or a day shredding trails on your XC mountain bike.” But to be terribly honest, we’re not very interested in climbing up mountains with this thing—at least, that’s not what we’ll be covering in this review. In this review, we’ll be finding out whether this bag will work as a daypack for your larger one bag travel pack. Which is right up our alley. 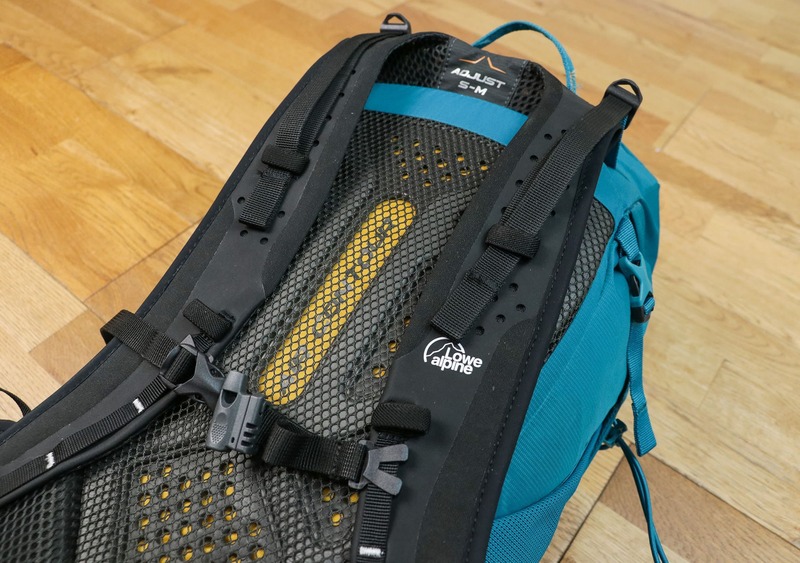 The Lowe Alpine Aeon is more substantial than other daypacks we’ve reviewed—like the Cotopaxi Batac and Tortuga Setout Packable Daypack—so is it worth that extra space within your pack? Let’s find out. The Lowe Alpine Aeon has a very outdoorsy look, which makes sense for its intended purpose. 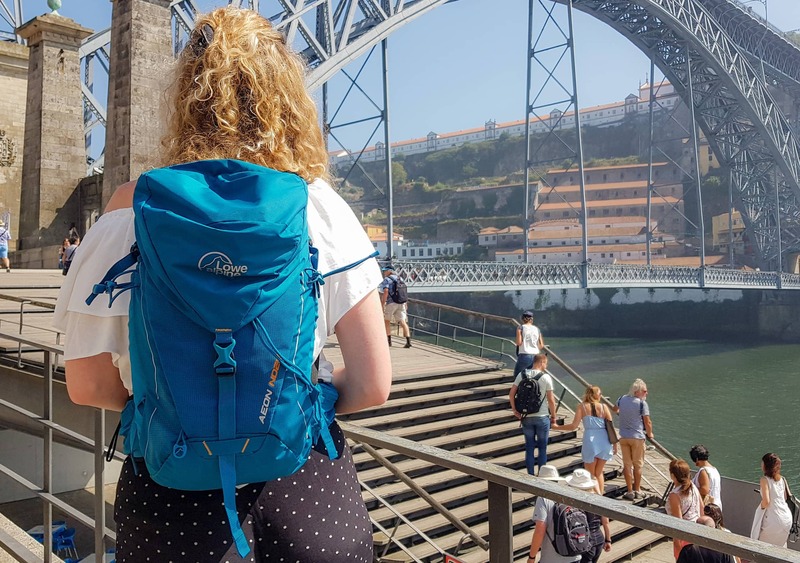 While this pack certainly didn’t look out of place exploring cities like Porto and Lisbon in Portugal, it does look more at home in rural Spain. 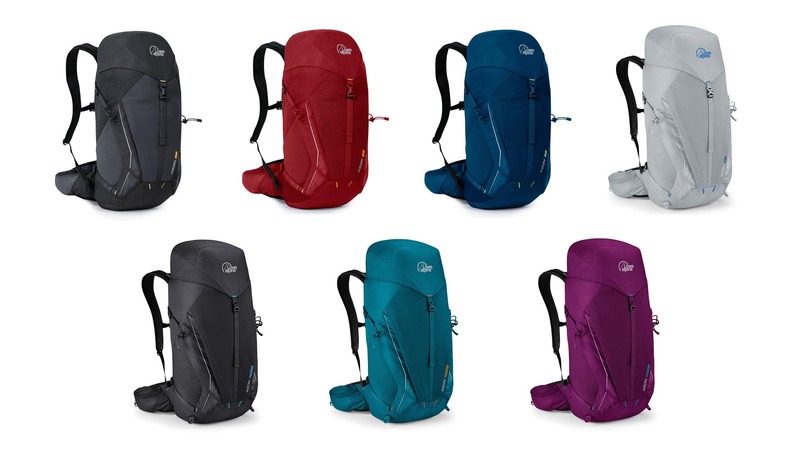 The Aeon 22 is available in four colors—anthracite (black), auburn (red), azure (blue), and greystone (gray). While the ND20 comes in anthracite (black), lagoon (teal), and ruby wine (purple). The color options are vast and varied, and we think at least one color should cater to your taste. We went with the Aeon 22 in greystone and the ND20 in lagoon—and we’ve been very happy with our choices. 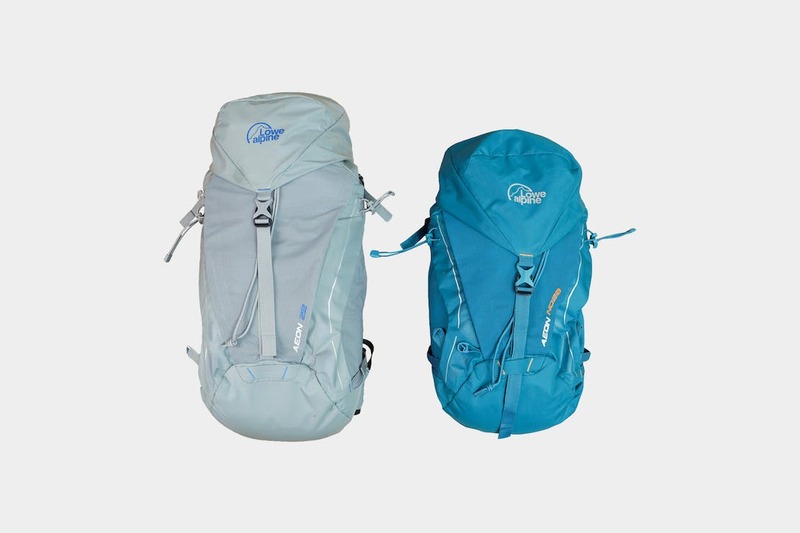 We’re big fans of how Lowe Alpine has branded the outside of this pack. 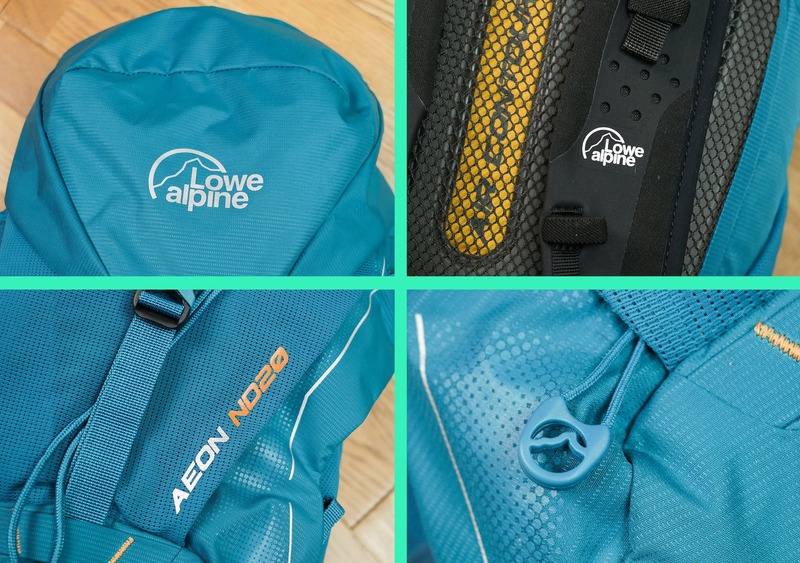 There is a Lowe Alpine logo on the lid and shoulder strap, plus the model name is on the front—which is quite handy as there are a fair few bags in the Aeon range. 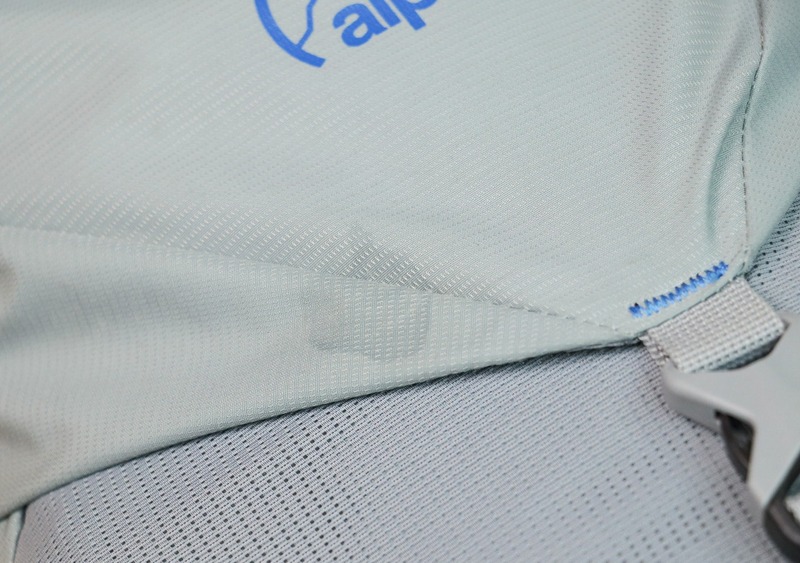 Finally, there’s a Lowe Alpine logo molded into the plastic of the zipper pulls on both of the external pockets. It’s pretty cool, and we’re digging the creative branding here. The primary material used is a 210D nylon. But this isn’t any old nylon. This nylon has Lowe Alpine’s TriShield® coating on it—a high-performance Silicone PU binding that increases weather resistance, abrasion resistance, and tear strength by 200%! That’s some pretty awesome stuff. For the layman, this thing is not going to rip, it’s not going to get scuffed up, and you’re basically not going to have to worry about it. We’ve been impressed with this lightweight material, and its durability has shone through after three months of heavy testing. Rounding off the materials, all the buckles are Woojin, and all the zips are YKK #5. 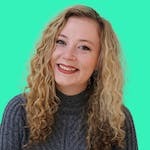 Both are quality brands, and while we haven’t tested Woojin buckles extensively ourselves, they have a great reputation—they work well, and should continue to do so for a long time to come. Other than the capacity of the ND20 being 2 liters smaller, it differs to the Aeon 22 in four key areas—back panel length, hip-belt, shoulder straps, and load distribution. The back length of the ND20 is slightly shorter because women tend to have shorter torsos than men, which also makes the ND20 an excellent option for teenagers! The hip-belt and shoulder straps are also shorter and shaped slightly differently to accommodate a woman’s body. And finally, the load distribution is altered, so the ND20 carries its weight near the bottom of the pack—which is achieved by making the ND20 slightly shorter, wider, and deeper than the regular fit version. 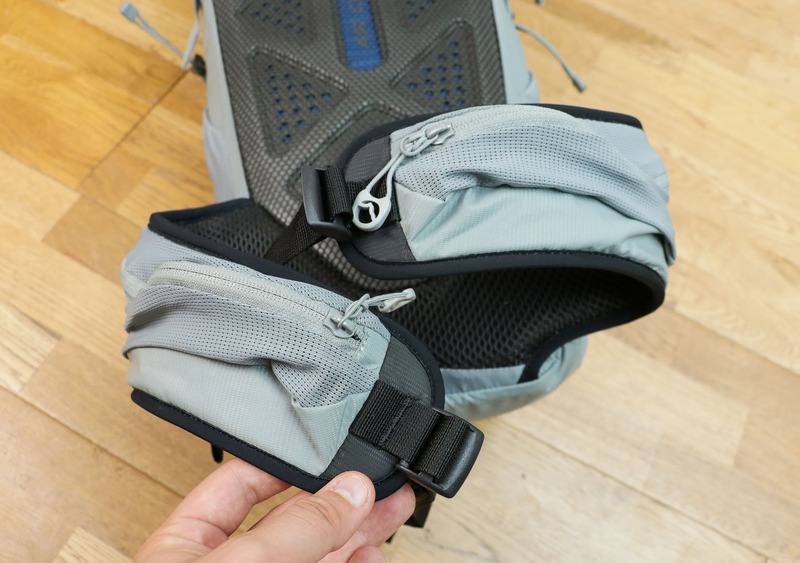 The Lowe Alpine Aeon has a lot of stuff going on externally, but we have to talk about the harness system first—because this thing delivers one of the most comfortable carries we’ve experienced to date. 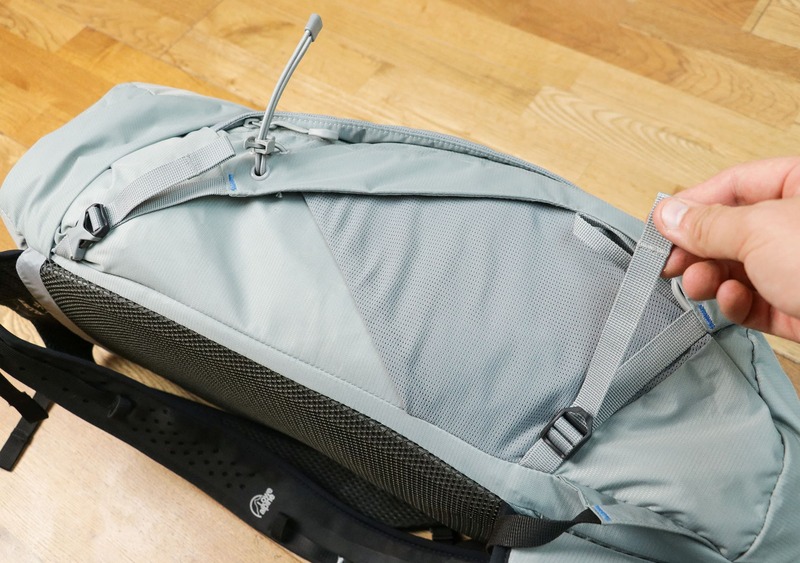 The ultra-thin straps are also a bonus when you’re putting the Aeon inside a larger one bag travel pack, as thinner straps mean this bag will take up less room. Back Sweat is largely inevitable, but the Aeon is going to fend it off for as long possible—and just by looking at the “Air Contour” back panel, you can tell there’s some pretty serious stuff going on here. 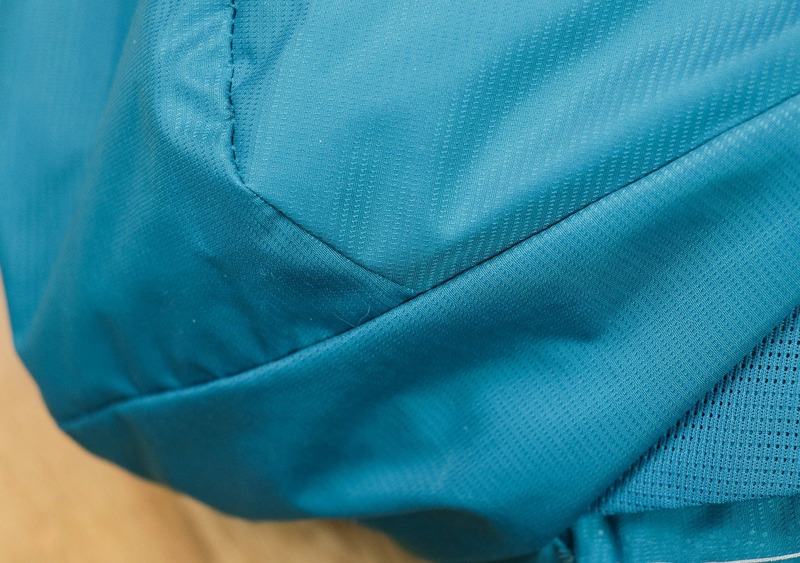 This back panel is incredibly well ventilated, body-hugging, and supportive—and we’ve been very impressed with its performance during testing. Amazingly, the shoulder straps and back panel are even height adjustable so that you can tailor the fit precisely to your body. 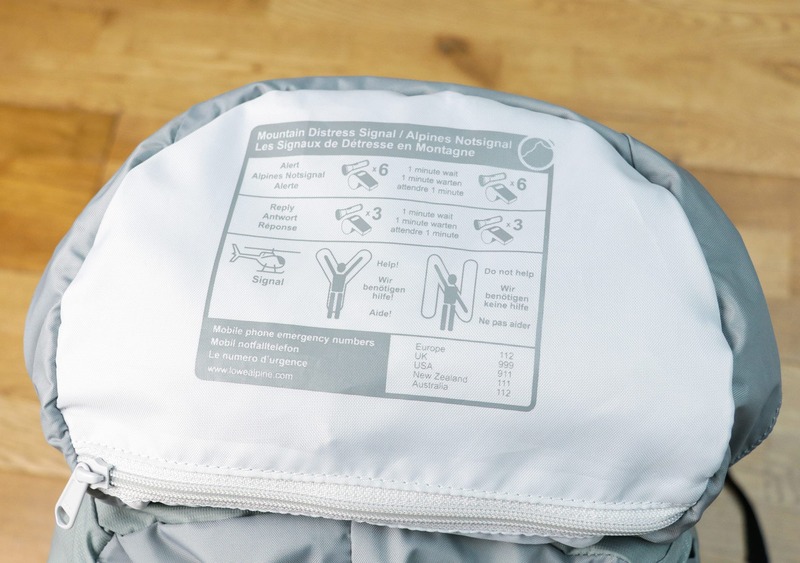 There is a sleeve between the back of the pack and the back panel that features a velcro attachment system, allowing you to move it up or down. Within this sleeve, there’s also room for a water bladder—if that’s your jam—with a small buckled loop to secure the hose. The Lowe Alpine Aeon also features a hip belt—which, considering this bag is intended for climbing and mountain biking, isn’t surprising. The already-fantastic carry plus this hip belt means you can really move around with ease while wearing this pack. 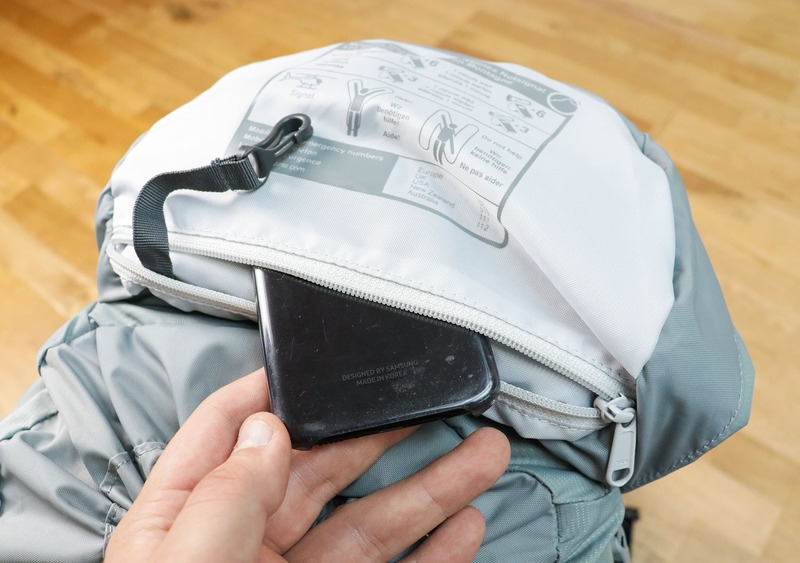 It’s a solid hip belt and features a pocket on either side for small quick-grab items like your keys—but unfortunately, it’s a bit too small for phones and wallets. 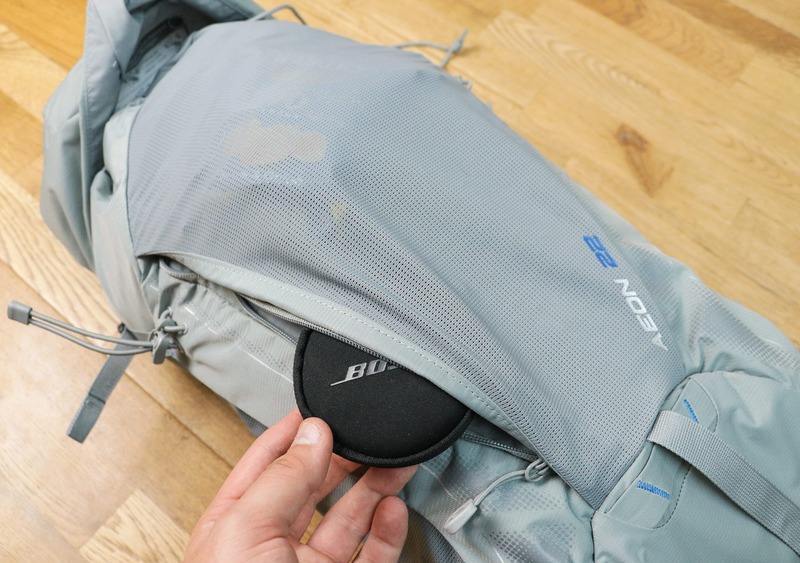 The hip belt isn’t detachable either, which can make for some dangling straps getting in the way if you’re not using it, and it does add a little extra bulk when you’re packing this thing inside a larger one bag travel pack. Completing the harness system, there are load-lifter straps—to bring the weight of the pack closer to your back—and an adjustable, removable sternum strap. There are fabric loops on the shoulder straps so you can keep the load-lifter straps secure too. On the front of the pack, there are straps dangling all over the place. Considering this is more of an outdoorsy adventure bag, this is understandable, and every strap has a purpose—you just may not utilize them all the time. First up, there is a Multi-Lock Tool™ on each side of the pack. This is made up of an adjustable cord loop at the top, and then a fabric loop and a circular plastic attachment point at the bottom. As the name suggests, this is a system through which you can secure a variety of different items to the outside of your pack—like an ice pick, walking poles, or helmet. 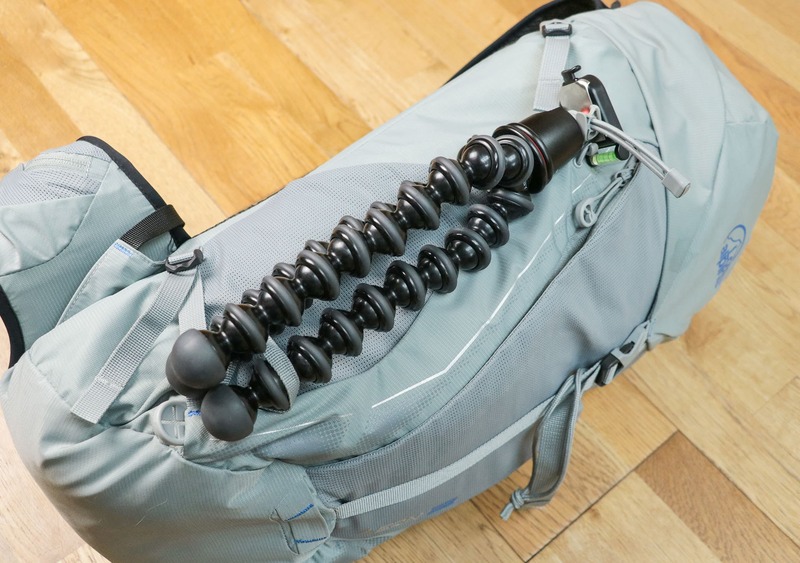 We didn’t use this too much, but it did work as a way to carry our JOBY GorillaPod 3K on the outside. There are two compression straps on either side of this pack. 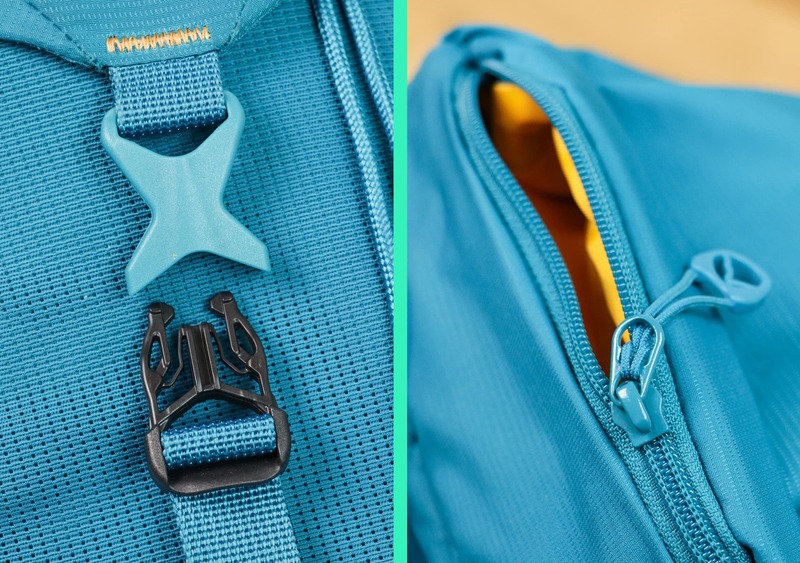 These straps are useful when you’re not carrying a lot of gear, as you can keep a slim profile while also limiting how much your items jostle around inside. Unfortunately, there’s no strap keeper system, so these things really dangle around on the outside. An example of a bag that manages excess straps well is the EVERGOODS MPL30, and we would have loved to have seen a similar system here. 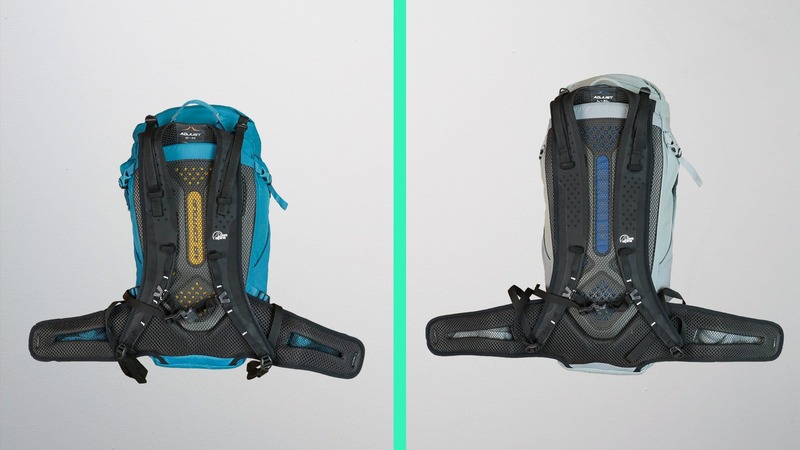 Finally, there are two large water bottle pockets, which is essential for a more adventurous pack. The mesh pockets are super stretchy and deep enough to hold nearly any sized bottle, which is great. We’re big fans of these and think that Lowe Alpine has really nailed this vital component. 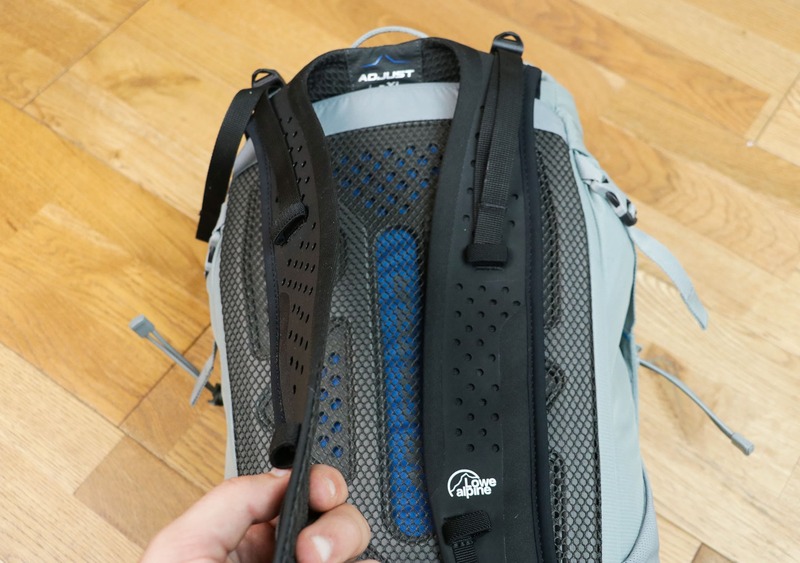 The Lowe Alpine Aeon has two external pockets—a large mesh compartment on the front of the pack and a quick-grab pocket at the top. The front mesh pocket is super stretchy, and you can cram a surprising amount of stuff inside—we used it to hold our earbuds and snacks. 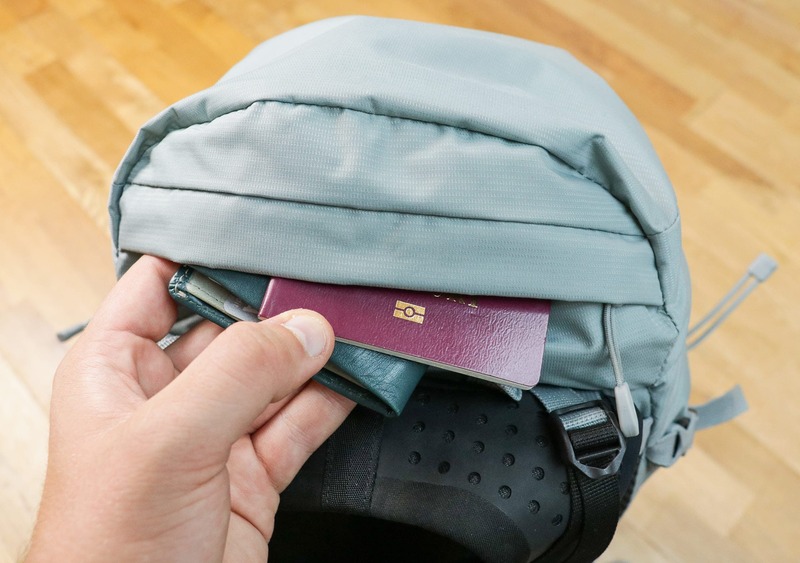 The top pocket on the lid is more discreet—since the zippered access is at the back—so we used this for our more valuable quick-grab items, like passports and wallets. And surprisingly, there is one more pocket in the lid of this pack. This can be accessed by unbuckling the front and lifting the lid up, where you’ll find a discreet zipper underneath. This is a great pocket, and we’ve found ourselves utilizing it more than we thought we would—there’s even a keychain, which is a nice touch. Finally, the main compartment in the Lowe Alpine Aeon is essentially just a large bucket for you to throw a load of gear into. We really like the opening of this pack, and the drawstring—that features handy pull tabs—is efficient and easy to use. 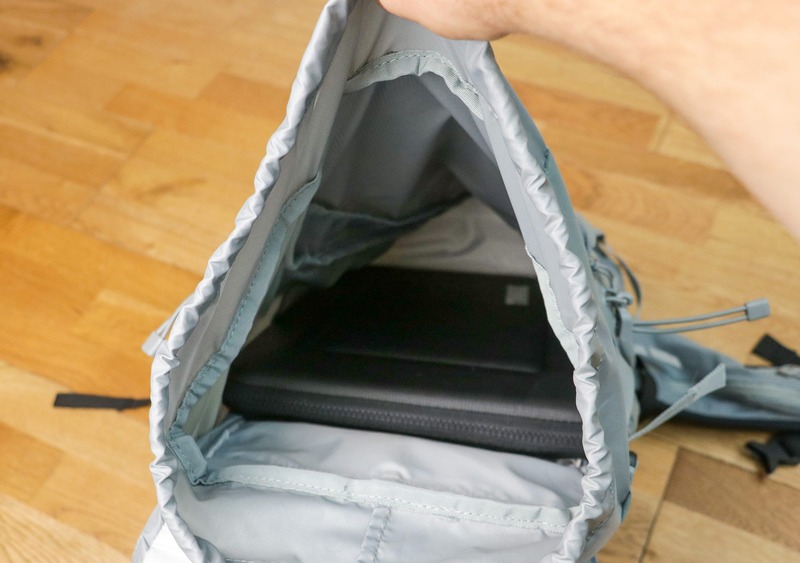 While there’s efficient room inside to hold a 15” laptop, there’s no independent laptop compartment—which is less than ideal. If you plan on carrying a laptop, make sure you’ve got a case on it. 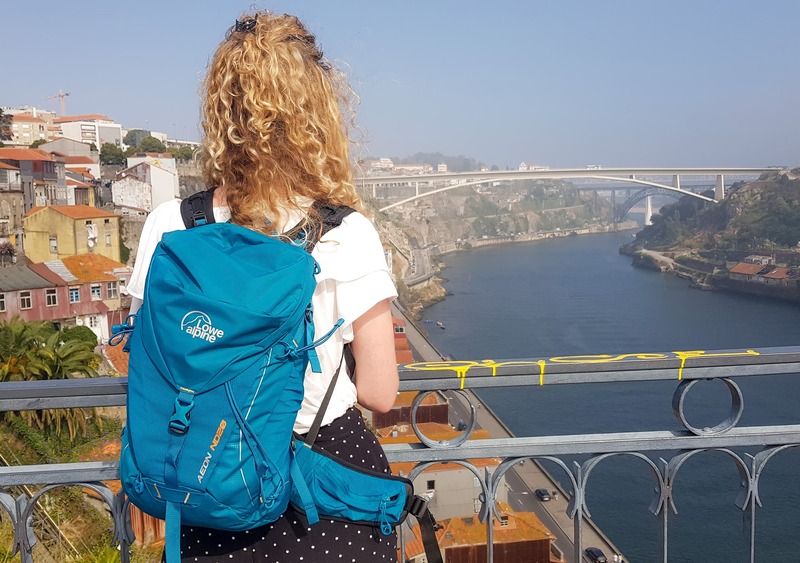 Over the last three months, this pack has seen use in rural Spain, urban Portugal, and around the UK. We’ve found this pack to be incredibly versatile and think it works well in a bunch of different environments. When it comes to durability, the Lowe Alpine Aeon is a well-made pack that’s built to last. All of the components are strong and sturdy, and the materials show no signs of wear and tear as of yet—apart from a small mark on the front of the greystone Aeon 22. It’s handled everything we’ve thrown at it, and we’re confident it will continue to do so for some time. 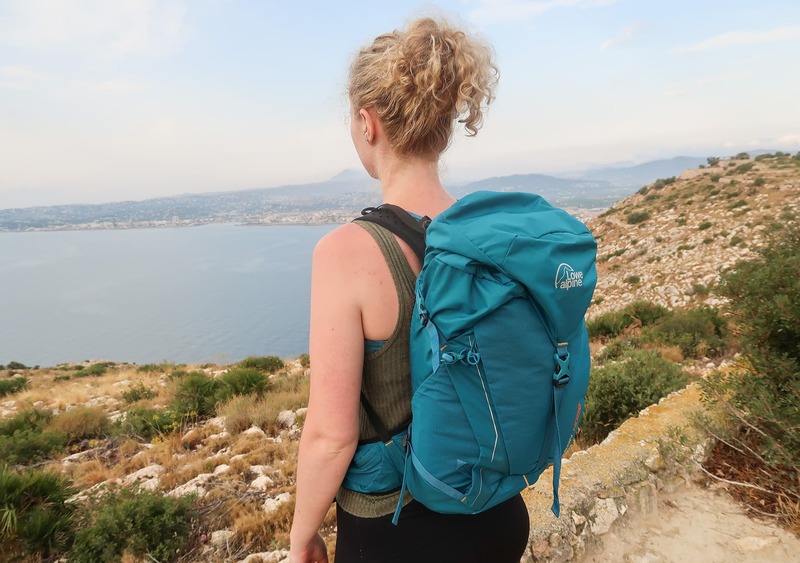 This pack is a bit different to the usual daypacks that accompany us on one bag travel trips, but we’ve thoroughly enjoyed using it. The Aeon is a real workhorse bag that does its job very well. 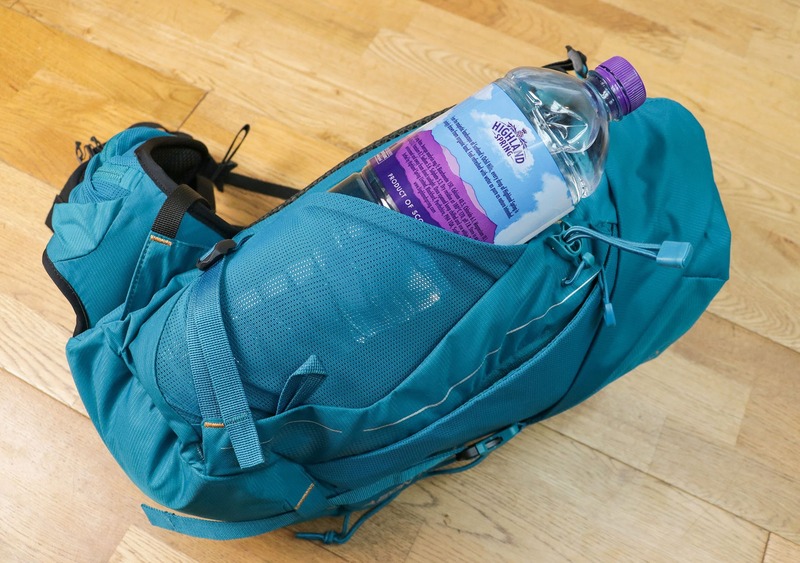 We did find it took up a little more space within our larger one bag travel pack than we’d have liked, but the benefits of having a more substantial daypack on trips made it worth the investment. Great colors, so many external components! This harness system delivers a seriously comfortable carry, worked great for some hiking in Spain. No signs of wear and tear, still going strong. Functionally, it’s still holding up great, although we noticed a couple small aesthetic dings on the Aeon 22. Available in a regular fit and women’s fit. Delivers an impressively comfortable carry. Straps can dangle on the outside. Hip belt isn’t removable and can get in the way when not in use. Outdoorsy aesthetic may not please everyone. This outdoorsy pack will stand out a little in a more urban environment—and it really doesn’t have the cleanest aesthetic—but the benefits of an impressively comfortable harness system and versatility are nothing to be sniffed at. If you’re looking for a daypack to fit inside your larger one bag travel backpack, and you need something a bit more substantial than a compressible daypack—the Lowe Alpine Aeon is a great choice.